The villa was designed with minimalistic flair by Rihan Peruma. Staying here allows you to experience the tropical life while also enjoying modern comforts and luxuries. The restful master suite overlooks the lake through the beautiful louvred windows. The room features both ceiling fan and air-conditioning for a perfect night sleep on the stunning four poster bed. There are large wardrobe closets and the en-suite is fitted with a bathtub to soak in and a hot/cold shower. There are two guest bedroom at Villa Lake House, one with a large double bed and a balcony with view and one twin-bedded room that comes with a TV and DVD-player, perfect for the kids. Both rooms feature AC and ceiling fans and they have private en-suite bathrooms. Around the pool there are sunbeds for those wanting to tan and on the veranda you can all sit together at the rattan lounge area, enjoying drinks, listening to music or reading a book in the surroundings of your own private piece of paradise. Villa Lake View features a beautiful multiple-level white house enriched by wooden panel windows. The pavilion has a perfect blend of tropical charm and modern comforts. The lofty, light-filled spaces are designed with cool polished cement floors and high airy ceilings. 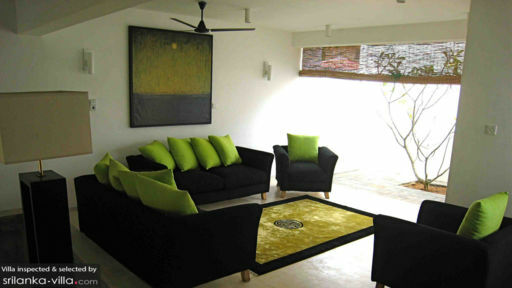 Adjoined by a peaceful little courtyard, there is a comfy lounge room, fitted with plush black sofas tucked with green pillows. This is the perfect spot for curling up with a book in the day and watching movies together in the evening on the flat-screen TV with DVD-player. 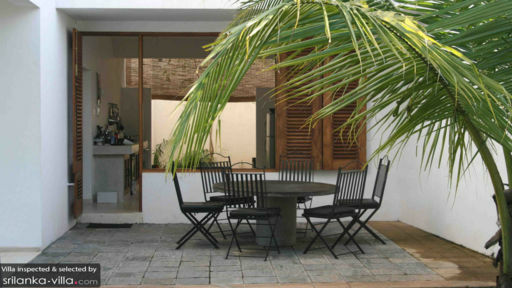 Meals can be enjoyed at the formal teak wooden dining table if not dining alfresco style once again out on the veranda. There is a spacious state-of-the-art kitchen where you can cook yourself or you can get an excellent chef to come and do all the cooking for you for an additional fee. You will be welcomed warmly upon arrival and looked after perfectly during your stay. All the housekeeping will be done for you and the staff is also happy to arrange day-trips, transport and more for you upon request. It is just three kilometres to the charming town and the beaches of Hikkaduwa. The local fisherman are out everyday to catch fresh fish and sea food that you can enjoy at one of the restaurants or even at home with a garden BBQ party. The ocean is great for snorkelling and diving, offering great possibilities for exploring the underwater world. You are also close to Naskadeniya village that overlooks the Bird Lake stealing the hearts of birdwatchers. Could not have found a better place to stay in the beautiful resort of hikkaduwa! The villa is modern, vibrant and exceptionally clean! The owners have certainly paid attention to detail! We spent some of our days relaxing in the garden by the pool which kept us cool in the hot weather! The kitchen is fully equipped to be able to make your own food and drinks whenever you want, down the road there are cute market stalls where you can buy amazing fresh fruit and veg.The location of this place is fantastic as you wake up with views of the beautiful and peaceful lake yet the hustle and bustle of the Main Street is only a 2 minute tuk tuk ride away, of which the staff are more than happy to arrange transport for you. Thanks to this villa we had a perfect holiday! I stayed at Villa Lake View for a week and could not have had a better time. It is both stunning and homely at the same time. The rooms are generously proportioned and tastefully decorated but there is a relaxed air to the villa that makes you feel at home; the owners have got a good shelf of books a wide range of videos and everything that makes your stay easy. Getting up in the morning to a fabulous breakfast, the noise of tropical birds in the garden, the pool a few feet from the outdoor eating area and a fantastic view of the lake was a joy every day we were there. The villa was very convenient 10 minute tuk tuk ride into Hikkaduwa town and beach when we needed a change of scenery. We even tried the bikes out one day and rode to the beach. The manager and staff were helpful and friendly and made our stay very enjoyable. No washing up required and we had the best Sri Lankan feast one evening prepared by the staff. We stayed there a few days and just loved it.... Although we arrived at night and wasn't impressed with the location at first and the drive there. We soon found out that it was all worth it when I woke up to the sound of birds and a sunrise over the beautiful lake down below from my spacious room out of my four poster bed , viewed from a window that opened up to the length of the wall , with a very inviting swimming pool below . I made my way down to stairs to a house that is very open and airy. The open plan style really compliments the surrounding area and gardens. The kitchen was huge and we cooked ourselves.... Which was nice for a change . They also had a washing machine which was welcomed after traveling around for two weeks... We managed to do our washing before we left . Close to town after all , it was a good location to visit other sites , and close to local restaurants , which I didn't really rate that much. Hence we cooked our own dinners and breakfasts. They do have someone there to cook for you at an extra cost . Would have been helpful if they did a starter pack of some basic items like milk tea and coffee , bread and some fruit to get you started, this could be fixed into the cost and would be greatly received as there was nothing there. The fresh coconuts from the garden were gorgeous and if you did need anything, they will go to the shops and buy it for you. We found the place safe enough to leave our two young boys playing in the pool all day while we went out as there was a house boy there to watch over them. Had major problems with the wifi, which I needed at that point ,which was very frustrating but did get fixed at the last min. Would I stay there again ???? Yup... Even if the bathrooms were a bit weird.....We loved it ! 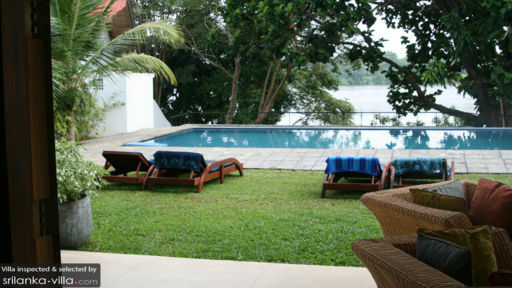 Look no further than Villa Lake House if you wish to stay in Hikkaduwa. We stayed in Villa Lake House for 6 days and it is absolutely gorgeous. When we arrived, we wondered around the huge rooms for half an hour just uttering words like 'wow' and 'amazing' - it really is so lovely, the photos on here and even the ones we took just do not do it enough justice! The outside is brought inside with their clever interior design which is beautifully executed, very well maintained and adourned with tasteful, solid pieces of furniture. There are 3 great bedrooms, we chose the master one with an awesome view of the pool and lake. The house is loaded with amenities a good collection of books, cd's, dvd's and an Ipod docking station, we spent every day chilling with our tunes on, splashing in the pool and soaking up the sounds and sights of this really, very peaceful hideaway. I contacted Ric the owner through his email and he give us a really good price, his manager Mr Chaminda organised our taxi from the airport. Udara, the guy that picked us up was professional, helpful and made the 4 hour trip enjoyable, we stopped for lunch on the way which was a great way to break up the journey. Susantha was also really very nice, he looks after the house guarding and cleaning. The centre of Hikkaduwa is easily reachable by Tuk Tuk, don't be put off thinking that this place is not in the town - because it is only 5 mins away - we cycled the bikes to town one day which was hard work but fun! There is a vast well equipped kitchen, but we chose to eat in the Asian Jewel hotel for Breakfast and Dinner as its literally a stones throw away. Just let Tanya and Dale know you're around - they are fab, extremely welcoming and the food is gorgeous. Next to the villa is also Kallabonga which serves food and drink with a great view of the lake at sundown. Not to be missed :o) All in all - a wonderful, peaceful, relaxing stay !